Hibernian maintained their free-scoring Easter Road form with a 3-0 win over Motherwell in their Ladbrokes Premiership opener. Stevie Mallan, Oli Shaw and Martin Boyle were on target as Hibs made it 22 goals from their last five home matches. The comfortable victory was all the more impressive given their likely first-choice strike pair Florian Kamberi and Jamie Maclaren both started on the bench. Kamberi stayed there after playing through a knee complaint as Hibs progressed in the Europa League on Thursday with a draw against Astreras Tripolis, while Maclaren came on in the 64th minute after rejoining the club on loan from Damstadt 98 on Friday. Hibs were also missing Darren McGregor after the defender went off in Greece and they initially struggled to break down a hard-working visiting side. But the game turned on the half-hour mark after Motherwell captain Peter Hartley was penalised for handball after Mallan’s shot hit his elbow. The midfielder accepted his second opportunity by curling the 20-yard free-kick into the bottom corner to take his season tally to four goals. Hibs doubled their lead in the final minute of the half. Motherwell appeared to have averted the danger following a Hibs counter-attack but John McGinn flighted a ball over their defence and Shaw got in behind left-back Aaron Taylor-Sinclair before squeezing the ball in at the near post. 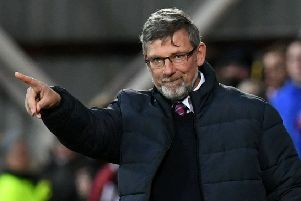 Motherwell boss Stephen Robinson brought on Gael Bigirimana and Elliott Frear at half-time and moved to a 3-5-2 formation. But hopes of a comeback diminished five minutes into the second half when Shaw laid the ball off for strike partner Boyle, who made room to fire into the bottom corner from 22 yards. It was grim viewing for Cedric Kipre, who was in the main stand watching his former club - 24 hours after making his Wigan debut following his big-money move on Friday. Substitute Danny Johnson provided some positives for the visiting support to take away after a lively display off the bench. The former Gateshead striker worked several good chances but was foiled by a combination of the post, a good block by Paul Hanlon, two decent saves from Adam Bogdan and also referee Bobby Madden’s whistle, which sounded for a not-immediately obvious infringement when he finally found the net. Hibs - who host Molde in the Europa League on Thursday - could have added to their tally though but Trevor Carson saved well from Maclaren.